Pics and video from a rally that was held in San Francisco to demand justice for "Bubbles" aka Anthony Torres. Friends, family, musicians, artists, plus THE LOCAL LGBTQ community held an event on September 22nd, 2017 to publicly demand the San Francisco police arrest the murderer of a local community icon named Anthony Torres aka Bubbles. The event started near the area where Bubbles had been found on the ground, near a public toilet suffering from multiple bullet wounds. 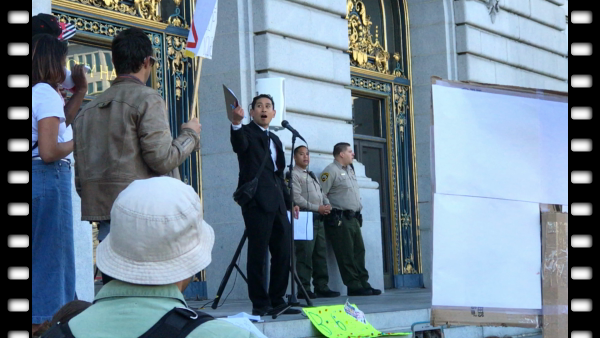 The organizers also started a petition to give to the Mayor that “demands San Francisco Police Department find the killer and/or make an arrest.” The event ended on the steps in front of San Francisco’s City Hall. As of September 23rd the police have not indicated whether they have arrested a suspect. §49 Murders so far this year. §Need more signers for petition.